Ian Birse and Laura Kavanaugh wield an impressive array of instruments, objects and electronics split between their large facing tables. They methodically stroke, bow and tease out noises both identifiable and arcane under the glow of an abstract projection that suits their sound. Flitting between laptops and soundboards over to tabletop guitar and violins and resonant metals and objects that resemble bathroom toilet paper racks, Kavanaugh and Birse build and dispel interlocking structures like a high level Jenga game. 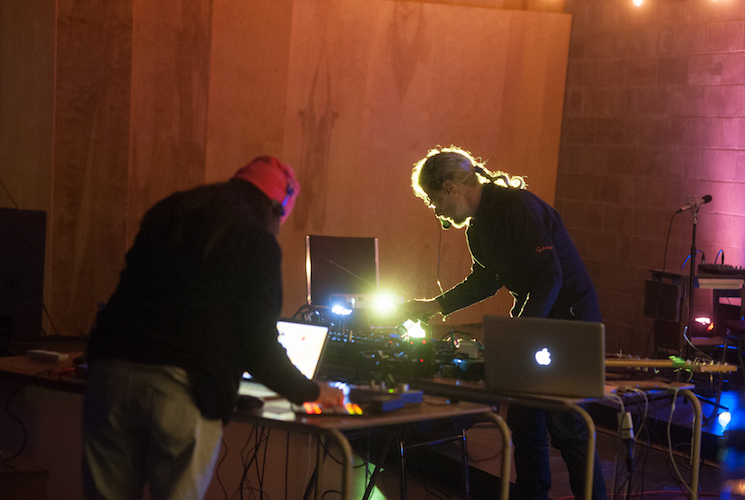 The duo are careful and wise to occasionally resolve the chaos of plinks and static and drones they've created back to near silence, allowing a flow to carry the experience of their performance. There was perhaps a lack of particularly "a-ha" moments where something clicked to transcend and illuminate the process they were undertaking, but the process itself kept us guessing and engaged.